By announcing itself as a spell, the poem suggests that the speaker will have great power: the spellcaster’s words override ordinary laws of nature. And yet, as the poem begins, we see this is less spell than plea: the speaker offers more and more of herself in a desperate bargain. The recipient of this prayer, however, remains unnamed—to whom is the speaker surrendering? Likewise, the terms of the plea are unclear: what would it mean to take “my most and only opal”? What does the speaker have to offer? We sense that neither the speaker’s tight and beautiful control of language nor her urgent offerings can be enough to appease—whom? what? The final line of the poem is a punch to the gut: the high lyric mode abandoned, the spell abandoned, the speaker implores her nameless tormentor to spare her just this one torment: do not take the child. Coming on the heels of such elevated lyricism, this direct, sparse plea is devastating. The speaker has abandoned the prayerful begging of “A Spell,” and now rails against the heavens: I’ll risk death, I’ll risk damnation, if that’s what it takes to save my wealth, my child. Yet even at this moment of rage and crisis, we see a powerful empathy in the speaker as she warns other mothers of danger. what each branch let down. In this moment of fear of the death of her child, the speaker must come to terms with her pain by taking a turn to the surreal, imagining “all the mothers,” “all the fathers,” and the “shaken” earth suffering together. In other words, she doesn’t understand her pain as her private pain, but rather as synecdoche for human pain. Tellingly, she speaks of herself in archetypal terms: “the mother can’t know / if she counts as a mother.” Even at this most private moment, Ford’s speaker thinks of herself as a symbol; implicitly, her suffering matters because it is not hers alone. The voice of the young scouts, singing and not thinking of the war. The voice of the detainees whose missing throats can no longer sing but whose bodies remain and must be accounted for. The voice of the speaker and all of us who remain here in the midst of violence. All of these voices at once, untitled, bracketed to a half-whisper. 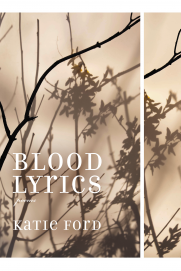 Blood Lyrics takes risks: these highly lyrical, highly sincere, highly empathetic poems have none of the ironic, skittery posturing all too fashionable in poetry these days. This is a poet who believes in poetry, believes in poetry’s ability to say something and mean it. What a rare and beautiful thing. J.G. McClure is an MFA candidate at the University of California – Irvine. His poems and prose appear in Gettysburg Review, Colorado Review, Green Mountains Review, and The Southern Poetry Anthology, among others. He is the Craft Essay Editor and Assistant Poetry Editor of Cleaver, and is at work on his first collection. See more at jgmcclure.weebly.com. Greetings! I’ve been reading your website for a long time now and finally got the courage to go ahead and give you a shout out from Dallas Texas! Just wanted to say keep up the great job!